Sterling silver cross bead is enhanced with green and white crystals, then strung on a sterling silver chain. This cross necklace has been hallmarked sterling silver by the Irish Assay Office at Dublin Castle in Ireland. This sterling silver charm bead features white crystals with a green crystal cross on both sides. The 3/8" wide cross bead may be worn on the included 18" long sterling silver chain or removed and worn on a bead bracelet. 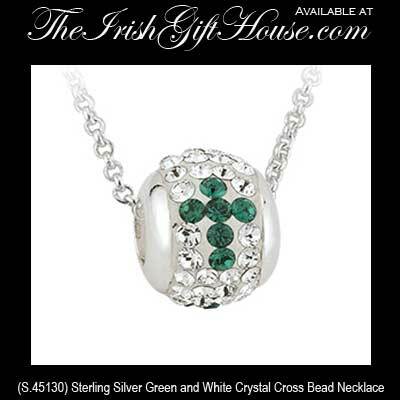 The cross necklace is made by Solvar Jewelry in Dublin, Ireland and is gift boxed, complements of The Irish Gift House.